Monsoon brings along with it life and greenery, but what it does to our hair is something we don't like. Having frizzy unmanageable hair seems unavoidable in this season, but, with our monsoon hair care tips you can minimise the damage to your hair and keep them full of life. Keeping hair dry is not the easiest thing to do when you are out and it's raining, but try and minimise the exposure the best you can. Always carry an umbrella or a raincoat with you. If you get your hair wet, make sure to dry them with a towel or cloth, as soon as you get the chance. Try your best to not let rain water remain on your head for too long, since it is known to cause dandruff. The best thing, however, is to wash your hair with a mild shampoo every time it gets wet in the rain. Due to pollution, the rain that falls to the earth isn't as fresh and clean as it should be; this makes washing hair after getting drenched in the rains a must. However, you must remember to avoid using harsh chemical-rich shampoos, and opt for a milder ones. Preferably, a shampoo with natural ingredients which can be used daily. The humidity in the air is a major contributor to the frizzyness of our hair. Oiling your hair 2-3 times a week is a good way to tackle the frizz and keep the moisture intact. You can also cover your oiled hair with a hot steamed towel to maximise the benefits of the oil and provide deep conditioning. As much as you crave warm pakoras and chai this season, try and avoid eating them on a daily basis. Include more protein-rich foods in your diet like green veggies, nuts, meats and eggs. All these foods are extremely good for your hair. Protein will help your body maintain your hair's volume and strength. When your hair gets wet, don't comb them out immediately. Wet hair is susceptible to breakage and rummaging a comb or brush through them will only lead to the loss of hair strands. Another thing to remember is to never tie wet hair. Tying wet hair will tangle them up and the untangling process not only pulls on your hair; hurting you, but will also lead to breakage. 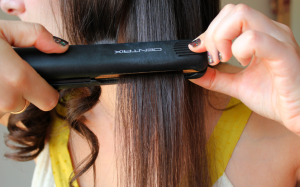 This monsoon, give your hair-dryers, curling-rods and straightening-irons a miss. Heat-treated hair tend to become more frizzy even when it's not raining; with the rains it just becomes worse. Also, the styling won't remain in your hair as long as it would normally, so why waste time behind it! Also read: Enjoy Monsoons, The Healthy And Happy Way! Short hair and pixie cuts are in anyway; so, why not try it out this season! Shorter hair means less breakage and less hair fall. Also, shorter hair is easier to dry and wash. Think about it. Try and maintain these simple monsoon hair care habits, to keep your hair their fabulous best this rainy season!